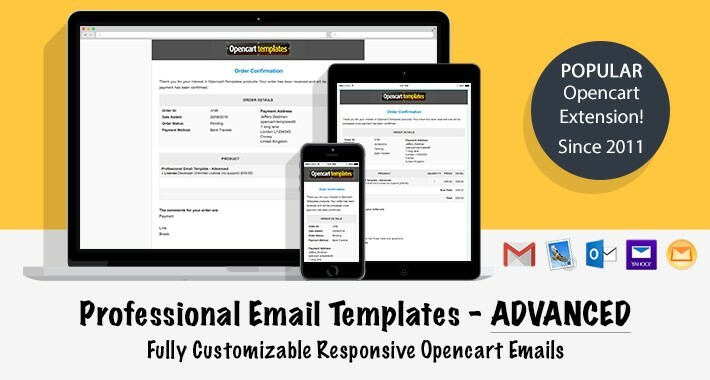 A complete solution for creating your own professional Open Cart emails on your store. Manage everything from how your emails look, easily changing the content and even how your email is sent. 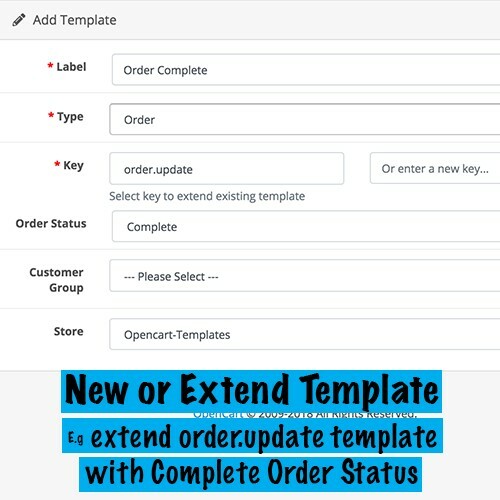 Committed Open Cart developer maintaining and updating this awesome extension to meet customer feedback, modern technologies and remain one of the most popular Open Cart extension since its launch. 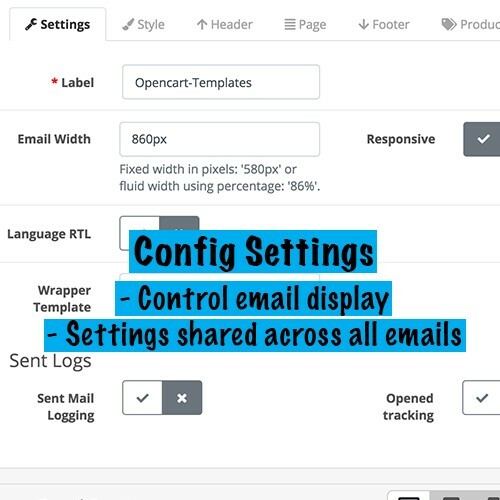 The aim of this new extension was to build a configurable email template which can be easily managed by non-technical users while also being flexible enough so technical users can customize to suit every email requirement in Open Cart. We take the pain out of coding HTML emails by providing you with a professional HTML email template that you can customize and add your branding without losing days testing. Mobile friendly HTML email that displays correctly in your customer’s inbox no matter which email client, browser and device they’re using. 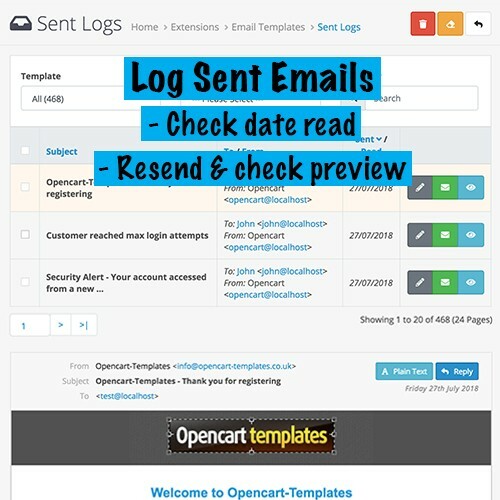 Quick install of all Open Cart standard emails or selecting which ones. Automatically setup for multi-language remembering the customer’s language. Also Right to Left support. GDPR compliant with opt-in marketing and customer email preferences letting customers control what type of emails they want to recieve: essential, notification & newsletter. Also option to hide promotional showcase products. Security notifications: send email to customer if password/ip has changed. Send email to admin if customer get locked out from max login attempts. Newsletter notifications: send email to customer/admin when a customer subscribes/unsubscribes from your newsletter. 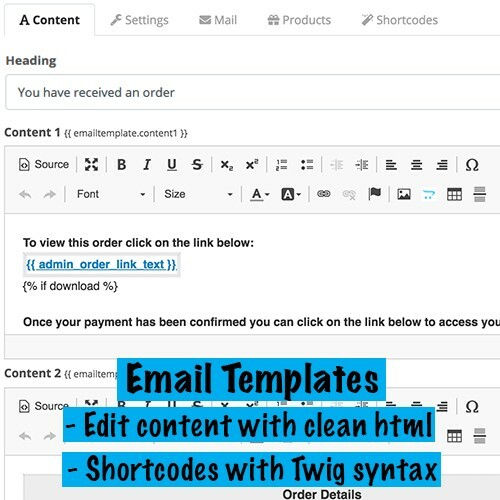 Templates lets you change the content of the emails using HTML editor with shortcodes (replaced with dynamic data) using TWIG syntax. 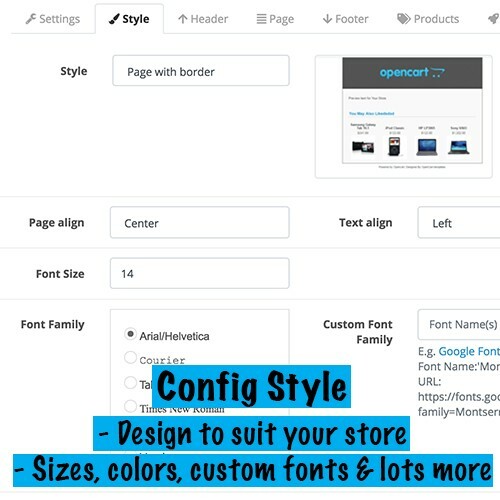 Config lets you customize how your email looks and everything from: colours, backgrounds, borders, spacing, padding, text alignment, custom font, shadow (works with images turned off), custom buttons design and lots more. 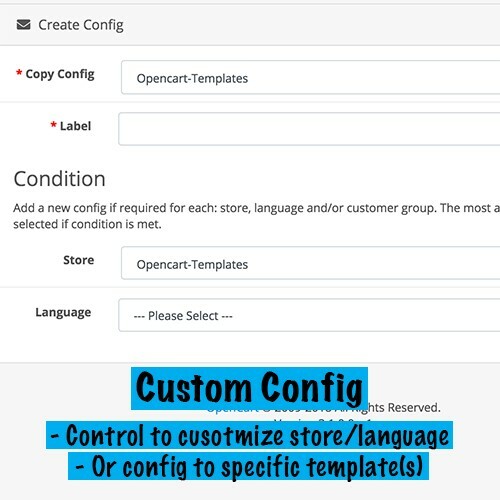 Create unlimited number of templates or configs for a specific store, language, customer group, etc. E.g. 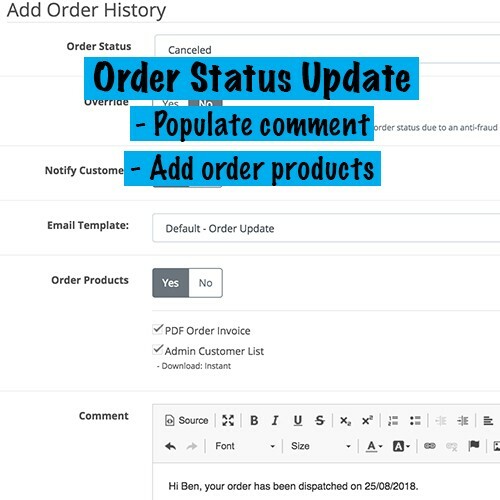 Create a specific order update email for shipped order status by extending the default one. The customizations possible with this extension really are endless. 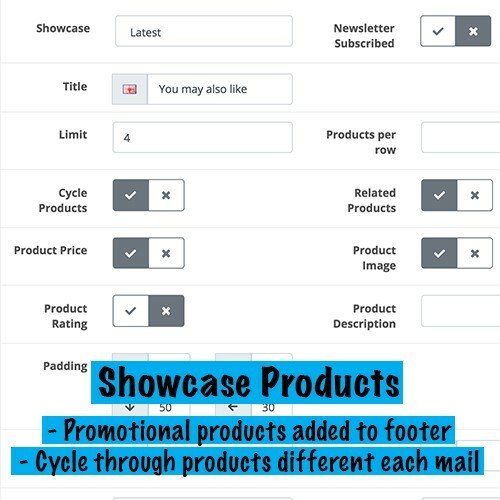 Showcase products can be added to the bottom of any email. Control if latest, feature, bestsellers, specials or manually selected products. Cycle through your products recording which ones your customer has seen and ensuring that no product is shown twice. Also hide purchased and give priority to related products. 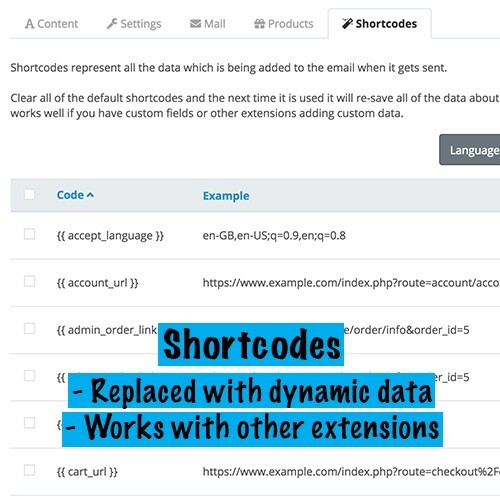 Shortcodes represent what data is available in the email template when it gets sent. This can be refreshed for your store to see your custom fields or if you have other extensions adding data to the email. 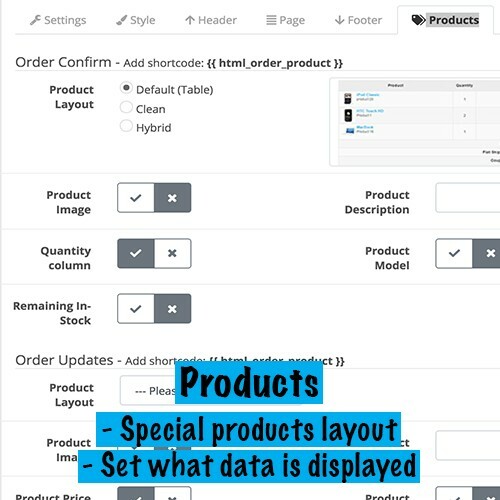 Order emails have the option to customise the layout of products with 3 layouts: default table, clean and hybrid. Also allowing you to hide/show: product image, price, rating, model and options. Also admin order confirmation includes remaining in stock. Preview your changes before saving with responsive views and no-images. 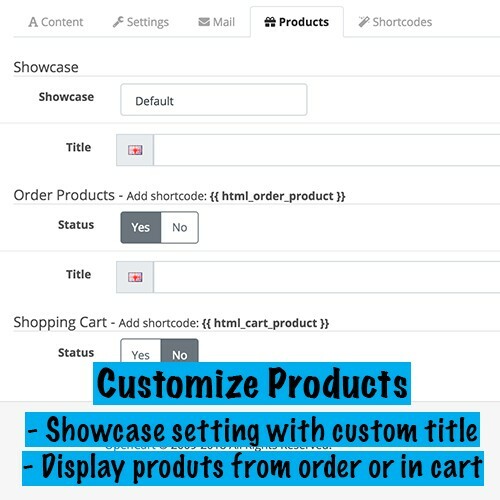 Display your customers shopping cart in any email. 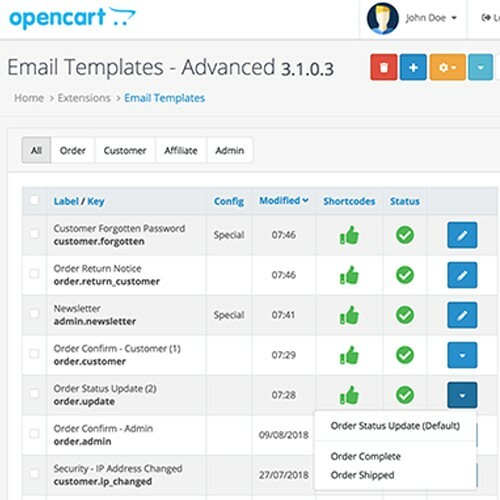 Add new Email Templates that's triggered by using Opencart Events. E.g create a template that gets sent when a customer unsubscribes from your newsletter without adding any extra code. 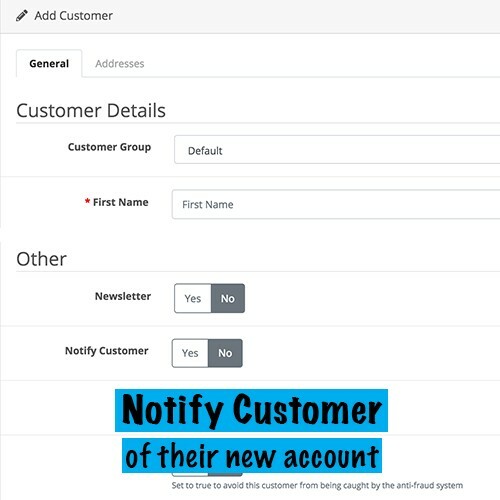 Added Customer History notify email. Seperated Approval/Deny emails plus all other opencart emails. 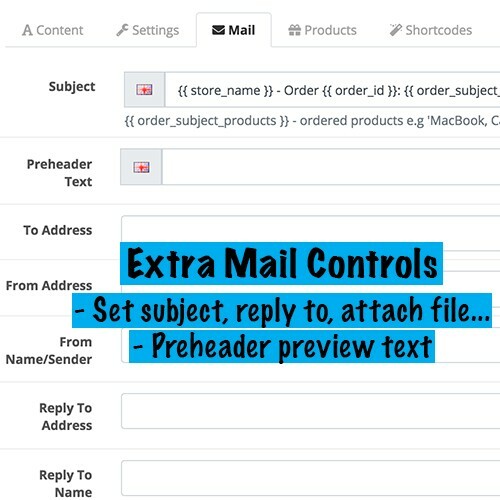 Overwrite default mail properties: To Address, Subject, Reply To, etc. Even add custom attachments. Mail queue via cron job. Most emails need to be sent straight away but non-important emails can be sent later. Newsletter email with unsubscribe and view in browser link. Also adds multi-language for translating newsletter content. CSS Parser - automatically adds all CSS inline. All changes via ocmod – no core files overwritten. Built in a way to be compatible with other extensions. Please get in touch if you think there’s a feature we’ve missed, or you would like something custom developed. DEMO all opencart vesions. If you’re using an old version of Opencart (before 2.3) contact us to make sure the feature you require is included because not all features are available in older versions. 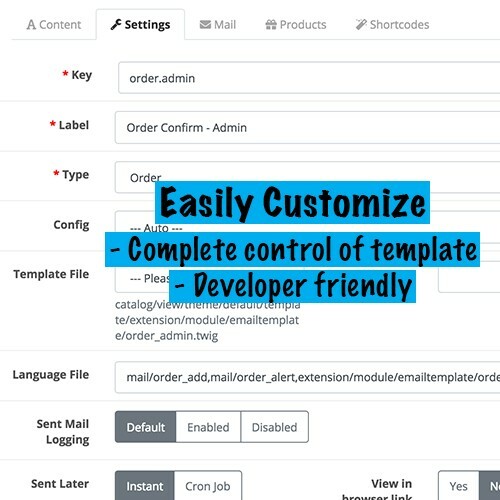 We also have another extension Default Professional Email Templates where you can make changes to the config styling only, each email template is built using the standard open cart way with language and php files. 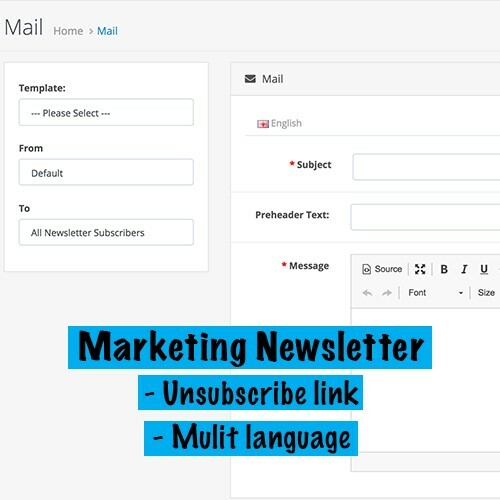 Compared with Advanced Email Templates where each email template is saved in the database allowing you to make changes to individual emails plus a lot of other features. Complete solution with outstanding features. Once you understand how it functions you will realize how good the extension is. Great extension. it may seem confusing at first but that's because it is capable of a lot. Well worth the money. Support came through in the end. Satisfied.